"For Innovation, Knowledge Is A Poor Substitute For Experimentation" - Forbes. Rawn Shah explores why there are more results tied to luck than planned research. "A Wild Love Of The World" - On Being. Buddhist scholar, Joanna Macy, on the poetry of Rainer Maria Rilke. "Not Exactly Rocket Science" - Discovery Magazine. For 150 years no one had ever seen a spade-toothed whale. Then two washed up on a beach. 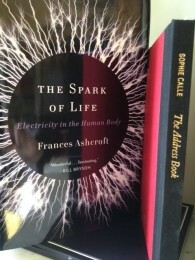 The Spark of Life: Electricity in the Human Body, by Frances Ashcroft. Aschroft explains the wonders of bioelectricity. The Address Book, by Sophie Calle. After finding an address book, Calle tries to understand a stranger by contacting his acquaintances.